Westcott Titanium Bonded Scissors, 8"
Lighter, Stronger, Sharper. 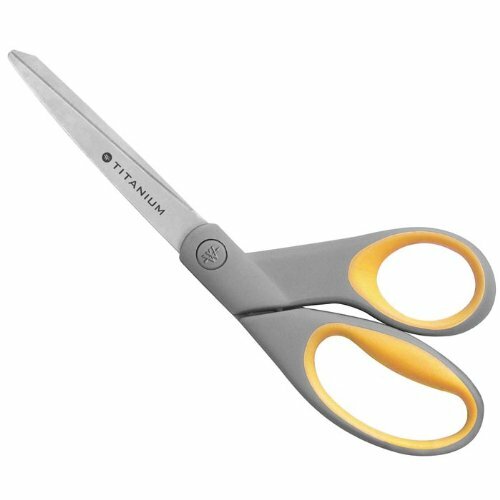 The original... Titanium bonded scissors are lightweight yet durable enough for any cutting job. Ideal for paper, cardboard, light line, fabric and other materials. Manufacturer’s limited lifetime warranty. 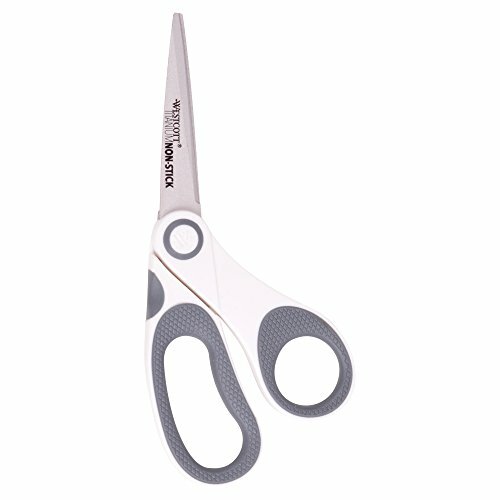 Titanium bonded scissors are lightweight yet durable enough for any cutting job. Ideal for paper, cardboard, light line, fabric and other materials. Our best performance scissors! ExtremEdge Titanium Bent Scissors. Titanium Bonded Blades are used for improved durability, increased corrosion resistance and a sharper, longer-lasting cutting edge. Westcott develops home and office products unmatched in style, design and performance. We continue to deliver results that are both inspirational and functional, earning the title of "The World's Favorite Scissors" year after year. Manufacturer’s limited lifetime warranty. Westcott Bent Titanium Non-Stick Craft Scissors, 8"
Westcott Titanium Bonded Non-Stick Craft Scissors are made from the very latest technology, combining Titanium with a unique Non-Stick coating that is permanently bonded to the blades. The result - blades stay sharper longer and resists adhesives from tapes and glue! The new Titanium Bonded Non-Stick blades are 6x longer lasting than the previous formula so blades stay sharpener longer. Featuring a unique comfort grip handles with added finger rest over mold. Complete with a manufacturer's limited lifetime warranty. Creating your next masterpiece is easy when you have the very best tools to work with. Westcott, the leader in cutting technology brings you a coordinated assortment of all the essential tools you need to bring your ideas to life. 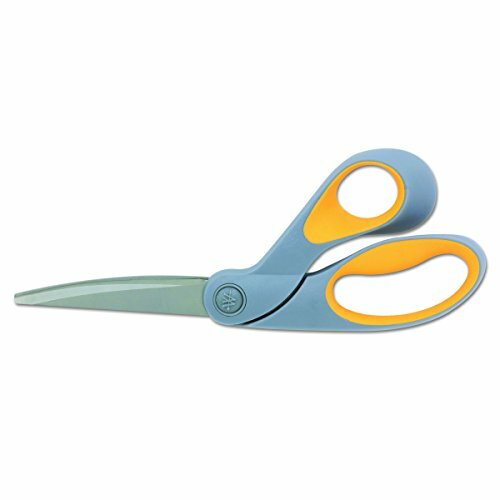 Titanium bonded scissors are lightweight yet durable enough for any cutting job. Our best performance scissors! ExtremEdge Titanium Bent Scissors. Titanium Bonded Blades are used for improved durability, increased corrosion resistance and a sharper, longer-lasting cutting edge. Ideal for paper, cardboard, light line, fabric and other materials. Manufacturer’s limited lifetime warranty. 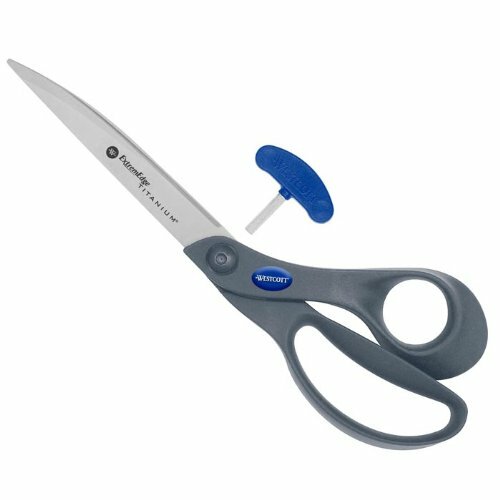 Westcott Titanium Bonded Non-Stick 8" bent scissors combine Titanium with a unique Non-Stick coating that is permanently bonded to the blades so that blades stay sharper longer and resist adhesives from tapes and glues. From the Manufacturer: Westcott develops home and office products unmatched in style, design and performance. We continue to deliver results that are both inspirational and functional, earning the title of "The World's Favorite Scissors" year after year. These Westcott scissors are bonded with Titanium for long lasting sharpness and smooth cutting. They provide comfort while cutting into crafting, paper, sewing and other household projects. Precision Ground Stainless Steel Blades. Sharp, double-honed stainless steel blades retain edge after long use. Corrosion Resistant. Westcott develops home and office products unmatched in style, design and performance. We continue to deliver results that are both inspirational and functional, earning the title of "The World's Favorite Scissors" year after year. Cushioned RibGrip handles for comfort and precision control. Specially designed handles work with your hands; whether you're left or right handed. Manufacturers Limited Lifetime Warranty. 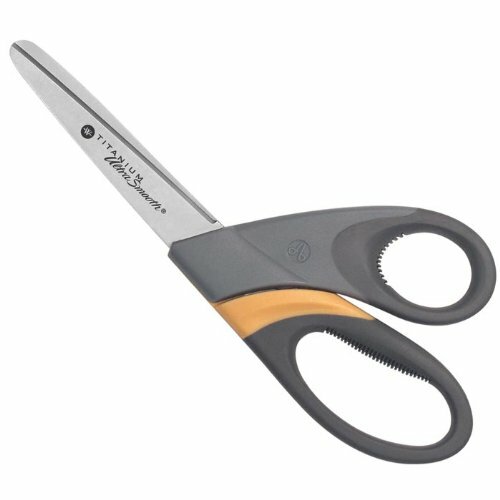 Looking for more Titanium Bent Scissors similar ideas? Try to explore these searches: Jewelry Drawer Trays, Glass Jar Manufacturers, and Fwd Front Brake Pads. Look at latest related video about Titanium Bent Scissors. Shopwizion.com is the smartest way for online shopping: compare prices of leading online shops for best deals around the web. 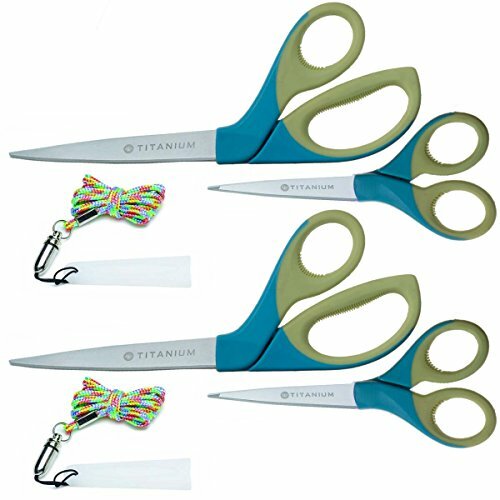 Don't miss TOP Titanium Bent Scissors deals, updated daily.